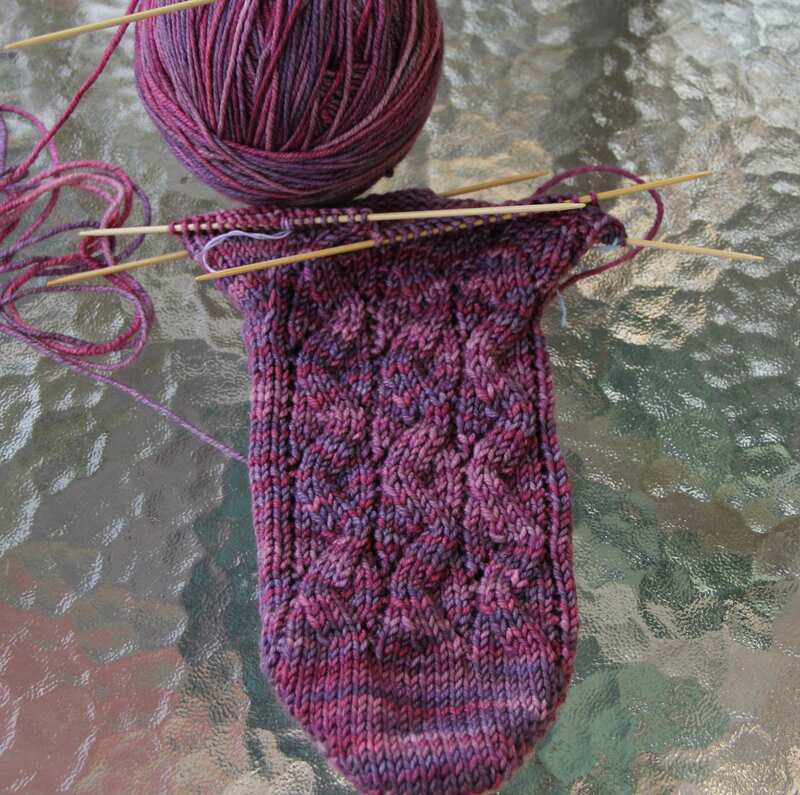 When working socks from the toe up, my preferred provisional cast on is the short-row. The kind with the wrap and turn (w&t) at the ends. Sometimes, however, this doesn’t work. Depending on the yarn, holes form at the w&t points when the wraps are picked up and knitted or purled together with their stitches. I border on being pathological when it comes to holes in knitting. The only time a hole in knitting is acceptable is when it is intentionally made. All other holes drive me more crazy than I naturally am. 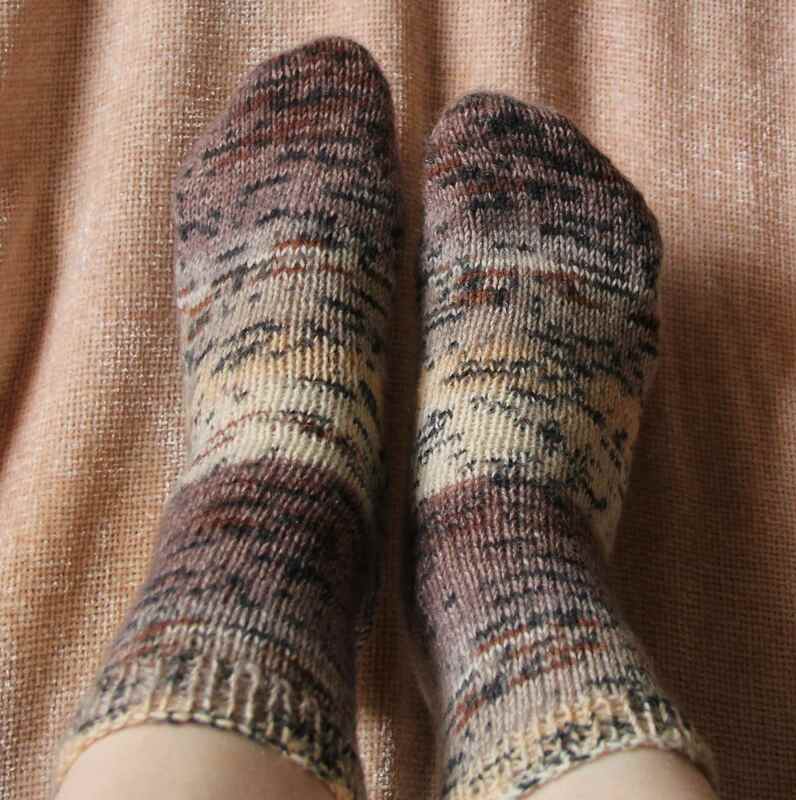 So when I was knitting my most recent socks and holes started to appear at the w&t points in the toe it was time for alternate action. I’ve tried the various non-short-row provisional cast ons and don’t like them. I dislike them for any number of reasons but the main two are: 1) they don’t look as neat as a short-row toe; 2) they don’t add reinforcing to the area of the sock that gets heavy wear and thus is worn through more quickly. 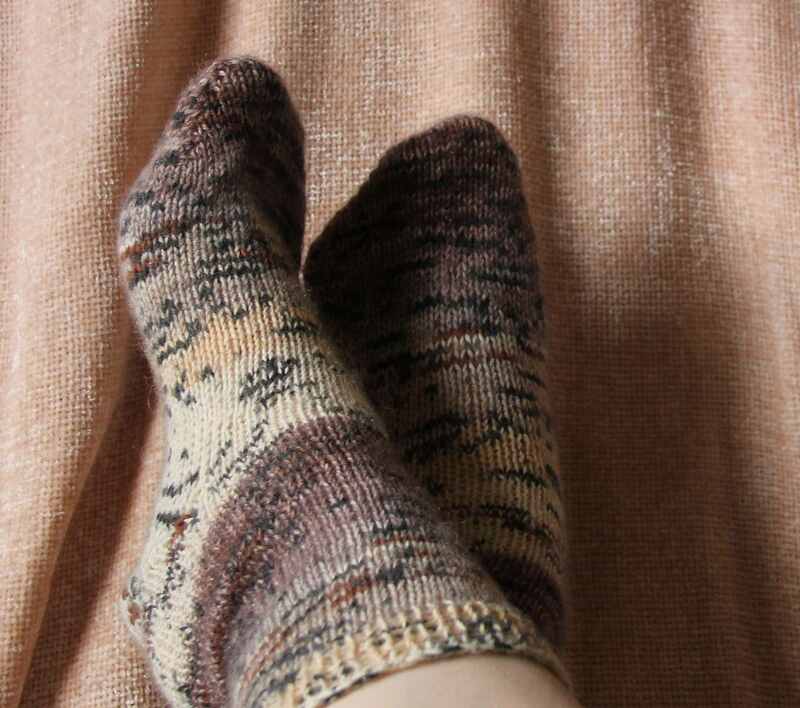 I like my socks to hang around with me longer than a season or two, which is why I knit so many. The more I have, the more choice, the less chance of one pair being excessively worn till it’s thread bare. After all, I use them from the beginning of autumn to the end of spring. That’s a lot of wear to spread out. So instead of ditching the short-row, I changed the type of short-row from the w&t to the yarn over short-row. The problem of holes in the toes was solved. Suzanne Bryan has a good YouTube tutorial on how to work the yarn over short row here for both the knitters who pick and those that throw. Check it out. The yarn over short-row is begun on a RS row and knit to one stitch before the end of a row. With one stitch remaining on the left needle, turn the work. WS Row: Work a backward yo by simply laying the yarn over the needle as if to purl. (Do not wrap the yarn all the way around the needle as you would for a normal yo between two purl stitches). Purl the first st. When the completed purl stitch is slipped to the right needle a yarn over should be between it and the stitch already sitting on the right needle. Hence, three stitches are now on the right needle. Purl to one stitch before the end of the row. With one stitch remaining on the left needle, turn the work. RS Row: Make a normal yo and knit to one stitch before the backward yo. Turn work. WS Row: Move yarn as if to purl and purl the first st on the left needle. When stitch is complete and slipped to the right needle, make sure a yarn over is between it and the stitches already on the right needle. Purl to one stitch before yo. Turn work. Repeat these rows until the desired amount of unworked toe stitches remain. RS Row: Make a normal yo then knit to the first backward yo. Reseat the backward yarn over so the rear leg of the stitch is now in front. Knit the yo together with the next st. Turn work. WS Row: Make a backward yo and purl across to the first yo. Work a SSP (slip one stitch knitwise, slip the next stitch knitwise, return both sts to left needle and then purl them together through their back loops). Turn work. RS Row: Make a normal yo then knit to the first 2 backward yos. Reseat both yarn overs and return them to left needle. K3 together (the 2 yos and the next knit stitch). Turn work. WS Row: Make a backward yo and purl across to first 2 normal yos. Work SSSP (slip one stitch knitwise, slip next stitch knitwise, slip next stitch knitwise. Return all three stitches to the left needle and then purl them together through their back loops). Turn work. Repeat the last two rows until all wraps and their stitches have been worked. For the heel, follow the same procedure. Toe up socks knit with Schoeller and Stahl Fortissima Colori in Mexiko Country colors on US 1 (2.25) mm needles.